Anurag Kashyap who just a decade ago reinterpreted the story of Devdas drowning in his agony of lost love, understanding very well the pulse of the new generation of the new millennium, now has ended up making Manmarziyaan while trying to underline the new shade of love in what can be called the post-love era, seems a decade behind of Dev D in its final vision. Inability to commit to a relationship, unwillingness to bracket the relationship into an institutional form, having no strings attached- these seem to be a new phase of romantic relationships among the new generation. All of this indicates the dawning of a post-love era, which the Bombay cinema has caught not just by making its eternally favourite subject of romance take a back seat in most of its recent films (dominated by biopics) but also by handling it directly in films like Befikre, Love You Zindagi, Aye Dil Hai Mushkil etc. The films which attempt to speak about this new post-love phenomenon, one can see the writers and directors not knowing how to resolve after the impossibility of love is established in the story, in the film. If in Befikre the director forces the couple to marry each other, Love You Zindagi introduces a fresh character and Aye Dil Hai Mushkil kills its protagonist. All of this shows how the Bombay cinema is struggling to give a closure to such a love. In such a scenario when Anurag Kashyap attempts to touch on this new shade of love, of course one expects him to understand its pulse differently. But sadly the film disappoints. An adventurous but indecisive girl (Rumi played by Taapsee Pannu ) & an equally adventurous but irresponsible boy (Vicky played by Vicky Kaushal) both impulsive and immature being in an inconsistent relationship is at the heart of Manmarziyaan. The decision to marry each other suffers in the first half due to the irresponsible behaviour of Vicky, the marriage of Rumi and Robbie (Abhishek Bachchan) suffers in the second half because of the indecisive behaviour of the girl, not able to get past Vicky or get involved with Robbie. 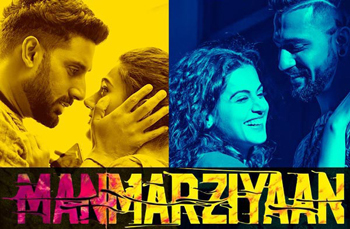 Manmarziyaan though reflects the love of a post-love era, falls flat on its nose because of its repetitiveness and heavy similarities to films of earlier days like Woh Saat Din and Hum Dil Dey Chuke Sanam. Like some of its predecessors exploring post-love phenomenon, Manmarziyaan loses its plot after exploring the post-love era love and collapses not knowing how to resolve it. It gets extremely disappointing when the film chooses the conventionally safe and convenient option for love defeating the quintessential nature of its characters and the director. The first half of the film is relatively more enjoyable than the second half as it mostly dedicates its time to beautifully unfold the characters Rumi and Vicky and the complications of their relationship through intense moments packaged light heartedly. The scene where Rumi discovers that Vicky has no solid plan for the two while running away and also has forgotten his wallet while eloping, is priceless. But both the characters repeating the same mistakes repeatedly and the story not going forward, does gets to nerves of the audience. At the intermission point suddenly and surprisingly the film gives a hope by breaking the repetitiveness. Greater expectations are set for the second half by concluding the first half of the film with the poem ‘main tenu phir milaangi’ (I shall meet you again) by Amrita Pritam, the Punjabi poet to whom the film is dedicated. The second half begins with great promise too when Rumi tells her uncle, “pyaar khatam nahi hua, shaadi shuru nahi hui” highlighting complications quite intense. But in no time the film again falls into the same repetitiveness, this time not because of the indiscipline of Vicky but because of the indecisiveness of Rumi. Added to her indecisiveness is the character of Robbie who is aware of Vicky but again like Rumi is quite indecisive. He suffers between wanting to make the marriage work and being a large hearted man who does not want to have any problem if his wife follows her heart. This nature of Robbie punctures the speed of the film and adds an extra layer of boredom to the repetitiveness of the storyline. Robbie’s idea of he being large hearted meets with a serious accident when he overhears a conversation between Rumi and Vicky when the both secretly meet each other despite Rumi’s marriage to Robbie. The audience expect the story to take an unexpected turn from this point but again the film starts going back to the same loop of indecisiveness and stretches the film for an annoying duration of over two and a half hours! While Vicky Kaushal is quite convincing as the commitment phobic and irresponsible small town boy with aspirations, Abhishek Bachhan is good enough to carry the boring Robbie who seems like an extension of Vanraj from Hum Dil De Chuke Sanam, but thankfully with a touch of playfulness. Taapsee Pannu as Rumi carries great energy and gives film the strength it has. If not for her the film would have not stayed afloat thanks to the heavy weight of the repetitive storyline and predictable screenplay.